My Review: I have to say that I was rather thrown by this novel. I'm a big fan of Alison Croggon's Pellinor series, so I naturally jumped at the chance to read another one of her novels. Not what I was expecting. At all. The Pellinor series is high fantasy and has a very richly developed world. 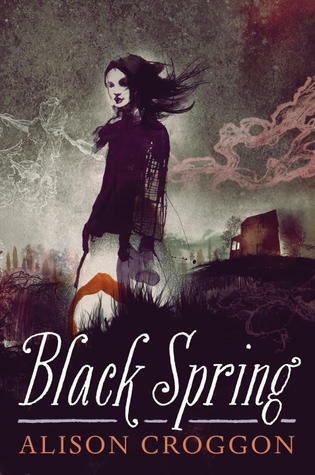 I hate to compare, but Black Spring just did not come even come close. I'm not going to turn this review into a comparison of which book is better, so I'll move on. Just a warning to fans of the Pellinor series, this will not be even remotely close if you are looking for something in the same genre. I have to say the way the POV was written in this novel was very unique. I don't think I've ever come across a writing style like this before. The only think comprable would be Lisa McMann's writing. Croggon pulled a complete 180 on her writing style and while it took me a while to adjust she pulled it off well. It was meant to be read in a certain manner and she achieved it. I should mention that this novel was inspired by Wuthering Heights. I will tell you right now, I have not read Wuthering Heights and am not a good judge of whether it was a good adaption or retelling or spin off of said novel. I will say that the tone she set for this novel and the world itself definitely fit into that era of writing. Very Victorian gothic feel, and I enjoyed the darker aspect of this story. Croggon does an excellent job of pulling you into the story. The only time you ever get a peek at Lina's thoughts is a brief portion of the novel that is written as her diary. You read everything from an outsiders perspective, and I have to say that was clever. The first POV of the book is a complete stranger and outsider to Lina and Damek's lives and you're left wondering what the hell is going on. Your curiosity as to just what the hell is happening never really ceases until the very end. The world this was set in was very interesting to say the least. As messed up and twisted as it was, I felt like I hardly knew anything about it. Not a lot of world building was done, but what was there was compelling. Frankly I would have liked more of it. This is definitely one of the few novels where there really was not a single character I grew attached to. I didn't care for Lina or Damek and nobody else in the story lept out at me. The two of them just did not inspire much sympathy. Considering the context of the story, I guess that really wasn't the goal. Terrible things happened to both of them, but in turn, they did terrible things to others as well. If you're looking for a happy story turn away right now. This is one of the most depressing and angst ridden novels I have ever read. There is no happy ending. And I'm not saying that is a bad thing. Not in the slightest. It's not my usual cup of tea, but it was well written and in the end it was a very chilling tale. Would I recommend this to everyone? No. But hey, if you like Wuthering Heights or that genre then give it a shot. It will be right up your ally. Ultimately, while different, it was still a good read. All in all, I'm still a firm fan of Croggon.